Statistically, most of us aren’t in the market for a new Koenigsegg like the Agera RS at the Toronto auto show. Fortunately, manufacturers like Chevrolet, BMW and Hyundai brought out slightly more affordable performance cars that you’ll likely see on the road this summer. Back in 1993, Porsche introduced the 993 generation 911 GT2 to meet racing homologation rules. Since then, it has become one of the most sought after classic Porsche‘s in the world. For example, a 911 GT2 Evo sold for an astonishing sum of $1.45 million at an auction last year! The 991 generation Porsche 911 GT2 RS definitely lives up to the reputation of its predecessors. It is the most powerful 911 to date with a 690 hp twin-turbo 3.8L flat 6 sitting behind the rear axle. Unlike its predecessors, the 991 GT2 RS abandons the manual transmission in favour of the 7-speed PDK gearbox. The focus of the car is on lap times. Case in point. The Porsche 911 GT2 RS dethroned the Lamborghini Huracan Performante as the King of the Ring by setting a 6:47.3 Nurburgring lap time. It still holds the fastest production car lap record at this time. At the Toronto auto show last year, Aston Martin’s AM-RB 001 Valkyrie concept stole the show as a preview of next generation hypercars. Mercedes-AMG decided to bring their Project One hybrid concept this year to show off their contender in the inevitable hypercar battle. Drawing from extensive motorsport experience in Formula One, the vision of the Mercedes-AMG Project One is a street legal F1 road car. The gasoline engine will be a modified version of the turbocharged 1.6L V6 from the Mercedes-AMG F1 car. The other half of the hybrid system will be an electric system consisting of four motors. Two of the four electric motors will be placed directly on the front axle. The third will be the MGU-H (Motor Generator Unit Heat) electric turbocharger. Last but not least, a MGU-K (Motor Generator Unit Kinetic) electric motor directly connected to the crankshaft. The estimated combined power output of the gasoline and electric motors is 1,020 hp! Without a doubt, the Mercedes-AMG Project One is one of the most ambitious hypercar concepts in recent years. If the Project One makes it into production, it would become one of the genre-defining hypercars of its generation. King of Virginia International Raceway may not be as catchy as King of the Ring, but it’s still an impressive title. As the home track to the annual Car and Driver Lightning Lap, VIR is an important benchmark for performance cars. Just days after the Ford GT took the top spot on the leader board at VIR, the Corvette ZR1 obliterated its lap time by 1.37 seconds. The ZR1 was equipped with the 8-speed automatic transmission and optional ZTK Performance Package. The adjustable carbon fiber wing, front splitter, sticky Michelin Pilot Sport Cup 2 and magnetic ride control work together to reign in the 755 hp from its supercharged 6.2L LT5 V8 engine. Chevrolet has been on point with their performance bargains recently. The Camaro ZL1 1LE seen at the 2017 Toronto auto show is an $80,000 car that can outpace exotics worth more than double its price tag. The C7 Corvette ZR1 continues the trend of Chevrolet performance cars punching way above their weight class. Now we eagerly await for the obligatory Nurburgring time attack video. As a former Subaru owner, I’ve been complaining for years about how the North American market never gets the special edition STI. Enthusiasts have been drooling over the 22B and S203 blobeye since they laid eyes on them in Gran Turismo and Forza. The wait is finally over, because Subaru is bringing a limited run of 75 WRX STI Type RA to Canada! Better late than never right? Type RA stands for Record Attempt, appropriately named for its 4 door Nurburgring lap record of 6:57.5. However, don’t expect it to chase down Porsche 918 right out of the showroom. The actual record setting car was a 600 hp NBR Special custom built by Prodrive. With just a 5 hp bump and flashy aero, it’s hard to justify the $57,900 CAD price tag on paper. However, special edition Subaru’s have always been about the details. The engine has stronger internals with forged pistons and sodium-filled exhaust valves for better heat transfer. Combined with the cold air intake, free flowing exhaust and ECU tune, the Type RA has a meatier power band while improving durability of the engine. 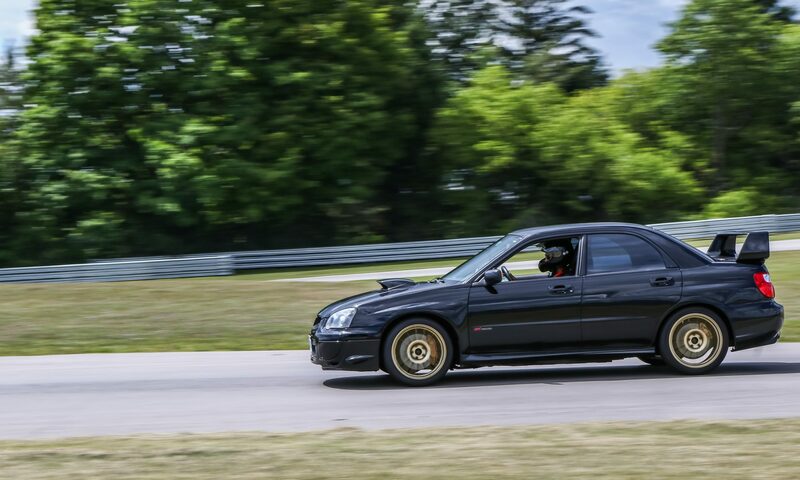 In addition to the engine, the WRX STI Type RA also features Bilstein shocks, aggressive carbon fiber wing and roof, gold BBS wheels and weight saving of about 68 lbs over the standard car. Here is the $60,000 question: is it worth the price tag? The WRX STI was already facing tough competition like the Ford Focus RS, Honda Civic Type R and Volkswagen Golf R. The more expensive Type RA would now have to fend off cars like the BMW M2 and Audi RS3. Having said all that, all 75 units were sold before the first car was even delivered. The Subaru enthusiasts have spoken, loud and clear! When word got out Hyundai had poached multiple executives from BMW’s famed M division, the automotive world realized that the Korean automaker is serious about their high performance N division. Instead of the i30 N, Hyundai will be launching the Veloster N for the North American market. The hot hatch formula is not exactly an industry secret, but Hyundai has shown that they understand the fundamentals. The Veloster N shares the same turbocharged 2.0L straight four as the i30 N. Output is estimated to be 275 hp and 260 lb-ft of torque. Power will be sent through a 6-speed manual gearbox. Being front wheel drive with lots of torque, Hyundai has created the N Power Sense front axle design for improved stability and steering. It seems to be similar in concept to other FWD hot hatches like the Dual Axis Strut on the Honda Civic Type R and RevoKnuckle on the MK2 Ford Focus RS. An optional electronically controlled LSD will be available, which should work well with the N Power Sense front axle design to really dig the Veloster N out of corners. There are multiple drive modes that control the driving experience. It will adjust the settings of the adaptive dampers, stability control, active differential, throttle response, rev-matching and variable exhaust. European publications have been singing the praises of the i30 N over established competitors like the Volkswagen Golf GTI and Peugot 308 GTi. With the Veloster N, Hyundai is determined to replicate its success overseas in North America. Perhaps one day, the Performance Blue on the N at the Toronto auto show will become as iconic as the Subaru World Rally Blue or the Honda Type R Championship White. Short for Club Sport, the new BMW M4 CS coupe is supposed to be the Goldilocks of the F82 M4 lineup. Sharper than the M4 Competition Pack, but more suitable for the streets than the track focused GTS. The twin turbo 3.0L straight six has been massaged to 460 hp, up 35 hp from the standard M4. The sports springs, dampers and anti-roll bars from the Competition Pack are carried over to the CS. BMW also spent a lot of effort shaving weight off the M4 CS. It shares the same carbon fiber hood as the GTS. In addition to other bits like the carbon fiber reinforced plastic roof, the CS is 70 lbs lighter than the standard M4 with DCT. Buyers will have a choice of aggressive Michelin Pilot Sport Cup 2 tires from the GTS or the Pilot Sport 4. Either option will be wrapped around lightweight DTM style forged wheels. The Cadillac DPi-V.R is the reigning Prototype champion of last year’s IMSA Weathertech Sportscar Championship. Campaigned by Wayne Taylor Racing, the Konica Minolta Cadillac won the team, drivers and manufacturer championship in 2017. Daytona Prototype international (DPi) is an IMSA specification similar to the international FIA LMP2 class. The chassis is the same, but the bodywork and engines can be manufacturer designed and homologated by IMSA. This allows manufacturers to feature their unique branding and design on the DPi racecars. The Cadillac DPi-V.R has a 6.2L naturally aspirated V8 behind the cockpit. The motor is actually loosely based on the supercharged LT4 from the CTS-V and C7 Chevrolet Corvette C7 Z06. Output has been restricted to approximately 600 hp. It’s strange for a racecar to make less power than the road cars they are supposed to promote. However, the Cadillac DPi-V.R weighs only 2,050 lbs with racing slicks, sends power through a sequential gearbox and runs advanced aero and chassis components. Even with a 40 hp advantage, the CTS-V would not stand a chance against the purpose-built racecar! Chevrolet might know how to make a Camaro dance around a track, but no other American muscle cars can touch the Dodge Challenger Demon on the drag strip. Building on the success of the 707 hp Challenger Hellcat, Dodge introduced the Demon with power bumped all the way up to 840 hp. It has the same 6.2L Hemi V8, but features a larger 2.7L supercharger, two dual-stage fuel pumps and a larger induction air box that draws intake air from three different sources. The Demon also has widebody fender flares that fit massive 315 mm Nitto NT05R tires front and back. Dodge even included a pair of skinny “front runners” to save weight at the drag strip! Other features like a dedicated drag mode and line lock, it’s very obvious that the Challenger Demon is built with one purpose in mind. The modern muscle cars can now chase down the very best sportscars from around the world on a road course. The Dodge Challenger Demon is not one of them. Instead, it’s a very fitting homage to the brand’s drag racing roots, living life a quarter mile at a time. Based on the beautiful Q60, the Project Black S Concept car is a technical showcase of the Nissan-Renault Formula One program. The concept car aims to bring the Energy Recovery System from F1 to the road. The gasoline engine would be the 400 hp 3.0L twin turbo V6 from the Q60 Red Sport 400. One electric motor is mounted at the end of the transmission, powering the rear wheels. The other would be attached to the turbocharger which will practically eliminate turbo lag at low speeds. It will be interesting to see if more technology from the Renault Sport Formula One team will be transferred over to sportscars like the Nissan GTR and 370Z successor in the future. What’s a sports car from the 90s doing on the list of performance cars from the 2018 Toronto auto show? To celebrate Mazda’s rich sports car heritage, they brought out some of their most celebrated sports cars. The lineup consists of an original Miata, the 3-rotor Cosmo grand tourer and the legendary FD RX7. In my opinion, Mazda created a classic by putting a unique sequential turbocharged rotary engine into a lightweight coupe body. 255 hp may not seem impressive today, but the RX7 weighs under 3,000 lbs. It’s also one of the most iconic Japanese tuner cars of all time with huge aftermarket support. Other legendary JDM nameplates like the Acura NSX and Toyota Supra have been revived recently, rotary fans are all hoping Mazda will join the fray with a proper RX7 successor. Porsche celebrated its 70th year anniversary of producing sports cars with a special display at CIAS 2018. The 356 is the car that started it all for Porsche, predating even the iconic 911 sportscar. The 930 generation 911 Turbo was Porsche’s first turbocharged 911 production car. Fast forward to 2018, almost every single 911 now has a turbocharger equipped, with the exception of the GT3. Porsche initially developed the Carrera GT as the successor to the 911 GT1 prototype racecar. Eventually it ended up as a halo car for the road. Its 5.7L V10 has one of the best exhaust notes of all time. Alongside the McLaren P1 and Ferrari LaFerrari, the Porsche 918 Spyder formed the Holy Trinity of hypercars. It puts down the 608 hp from its hybrid powertrain with an advanced AWD system. Even though it has less peak power, it can go head to head with the fastest hypercars. The PASMAG Tuner Shootout featured some of the best modified cars at the Toronto auto show. JDM tuner cars from Subaru and Nissan dominated this year’s display. A pair of Subaru racecars built by Can-Jam Motorsports, one for time attack and another for rally. The Versace GD Subaru Impreza STI has been a regular sighting at CSCS time attack events. Crazy Leo has been dominating Production Class of the Canadian Rally Championship. He’s beaten faster open class cars on multiple occasions with his Subaru rally car! Representing street-driven Subaru’s were a pair of VA generation WRX and STI with wide fender flares. There was also a Subaru BRZ and R32 Nissan Skyline GTR both with Rocket Bunny Pandem widebody kits fitted. This RHD S15 Silvia drift car was reminiscent of the HKS Hyper Silvia from D1 competition in the 2000s. The 300ZX with Marlboro racing looks more suited for a Wangan highway run. The turbocharged V6 makes close to 600 whp! Fans of the Fast and Furious franchise would definitely appreciate the Volkswagen Jetta built to be a replica of Jesse’s car from the first movie. Thank you to the talented Adam (@urbancore.to) and Jake (@shotzbyjake) for the beautiful automotive photography at the show this year. Make sure to check out their Instagram profiles for more of their work!